Parents may intend to set strong limits on their teen drivers but their kids may not always be getting the message, a new nationally-representative poll suggests. In families where parents reported limitations on their teen drivers—such as restricting cell phone use, number of teen passengers and driving times and locations—teens themselves sometimes said they did not have those limitations, according to the C.S. Mott Children's Hospital National Poll on Children's Health. "We know teen drivers are vulnerable to distractions while driving, and that they are also at the highest risk for crashes," says lead author Michelle L. Macy, M.D., M.S., an emergency medicine physician at the University of Michigan's C.S. Mott Children's Hospital. "Parents play a key role in promoting the safety of their teens by setting expectations for driving. We found that the great majority of parents do have rules for their teen drivers; however, teens consistently perceive fewer limits on their driving than what their parents report. This signals an opportunity for parents and teens to have more conversations about safe driving habits." Parents of teens 13-18 years old and teens themselves were asked about limits placed on driving circumstances that can increase a teen driver's risk of a crash. About nine in 10 parents report they place at least one limit on their teen drivers while eight out of 10 teens report having at least one driving limit placed on them by their parents. In families where parents report limits on cell phone use while driving, 13 percent of teens say they have no limits. 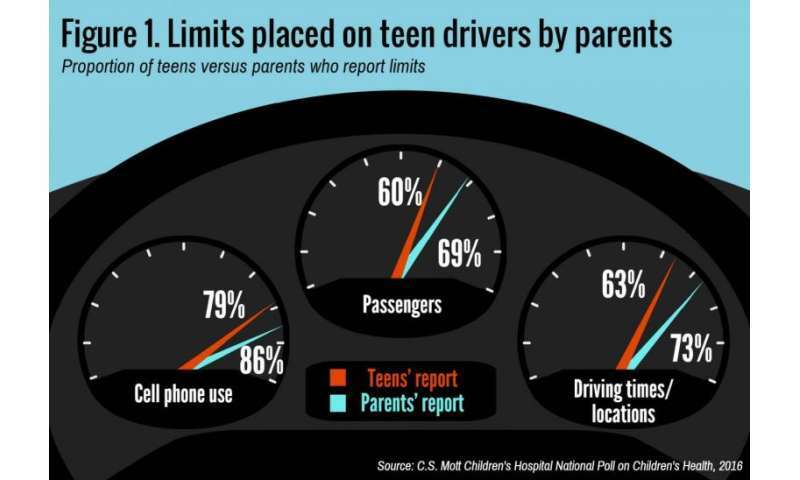 In families where parents report limits on teen passengers or nighttime or highway driving, 20 percent of teens say they have no such limits. Meanwhile, parents who judge their teens' driving ability as "above average" (32 percent of all parents) are less likely to place limits on passengers and driving times/locations. Sixty-seven percent of parents set limits on passengers for their "above-average" teen drivers, compared with 81 percent of parents who perceive their teen drivers as "below average." Macy recommends parents model good driving behavior themselves starting when their children are young and that they have conversations about safe driving early. "It's never too early to start modeling safe habits for your kids like not answering texts while driving," Macy says. "It's also a good idea to have conversations about rules of the road long before your child is ever in the driver's seat."